Christmas is the best holiday ever! I love it. I love to be with family and give people presents and make people happy. We were so incredibly blessed this Christmas. There were so many people that were looking out for us and have been angels in our lives. Thank you to those people. I don't have anything exciting to write about really. Christmas was so fun. Christmas Eve I received my last long treatment where I get all three drugs. It went well. It was really fun passing out the caramel popcorn I made to everyone. We gave all the nurses, patients and visitors a bag. It made lots of people really happy and that made me happy. After chemo we had my family Christmas Eve party which is always fun. We ate lots of food, made crafts, played games and opened presents. It is my favorite part of Christmas. Christmas day we saw Les Misreables which was so incredible! I saw the play when I was like 14 and I didn't really like it because I didn't understand the story line very well. But the movie was very clear and it was so emotional and captivating. Wednesday we were supposed to go skiing but I woke up feeling really chemo sick :/ I always forget that when I get all three drugs I feel a lot more tired and sick. I ended up staying in bed till noon-thirty.Thursday I still felt a little sick but we went skiing anyway. The snow was awesome! Deep powder and such. But it was freezing. And I was really tired and still kind of sick :/ lame-o. It was still fun though. And I got to see my friend Courtney after! Yay! She lives in New York so we only see each other once or twice a year. It was fun to get to visit with her. Today I went sledding. I love doing things outside. We caught a mouse sledding. His name was Rufus. Now the week is almost over and that means New Year's is coming! Usually New Year's is not one of my favorite holidays seeing as I think it's late when I'm not in bed by ten, but this year I am extra excited. I'm excited because it is my END OF CHEMO PARTY!!!!!!!!!!!! I mean I'll still have one more treatment after New Year's but that is it! Can you believe it?! I actually can't. It doesn't seem real. Since June my life has been one Monday to the next. I live from Monday to Monday. But shortly it will all be over and I can live life as a semi-normal person. I will only have to go to the Huntsman every three weeks for an hour instead of every week for 4-6 hours. I'm most excited to have my hair grow back. The bald/super short hair thing was fine for a while, but I am ready for some hair. Well....yep. Sometimes I don't know what to say at the end of a post. So um, bye. This week we went snowshoeing lots! Three days in a row. The first day it was just me and Sterling and the doggies, then we went with Cesia and her husband Chris and Thursday we went with my friends Selma and Ellen from high school! It was so fun! I love the mountains and the snow makes them so pretty. It is really fun getting to hang out with friends that I haven't talked to or seen in forever. Ellen and I were best friends in junior high, but we haven't really talked much since, so it was really cool to catch up. Maybe soon I can start running with her and Selma as they train for a marathon.....ick haha. Today my mom and I baked goodies ALL day. We made like 500 batches of caramel popcorn, some pretzel/rolo turtles, homemade Almond Joys, gluten free M&M cookies, and chocolate mint Rice Krispies. Holy moley! I made 60+ bags of caramel popcorn to take with me to chemo on Monday. I am really excited. I love giving things to people there, it makes them so happy. Koda has been limping around since Friday morning. We aren't sure why :( It is really sad. We wrapped him up so he wouldn't put it weight on it and hopefully he will heal up faster. Poor little buddy. Well, I can't wait for Christmas!!!!!!!!!!! Can't wait to get treatment Monday because then I will be almost done! AH! I want hair on my head again. I'm over the bald thing. Boo :( No treatment for me today. This has been a really looooooooooooong week. I don't know why. I've done fun things. I haven't really been sick. But it has gone by SO slowly. Tuesday and Wednesday I had my math and chemistry finals. Finally! Although I have been graduated for a year now, next semester will be the first one in my life that I haven't been in school. Yay!!! Holy smokes it feels so good. I can get a job and have a semi-normal life. Minus all my check-ups and treatment every three weeks for a year. Thursday I went skiing at Snowbird! It was pretty fun, but I went by myself and the snow wasn't all that great. But Friday I went skiing with my family at Brighton and it was super awesome!!! The snow was actually quite good and it was really fun spending time with my brother Josh and my parents. And Sterling of course. But I always spend time with him. I was surprised at how well I was able to do. We took breaks of course, but I mostly did really well. Even though the next day I could hardly walk up the stairs without breathing hard....haha. Yesterday I got to finally sleep in. And I woke up to 5 inches of snow! I am so happy!! I love snow in December, it is so beautiful. My other best friend Brooke came over and we made gluten free brownies and Christmas cards :) I forgot to get pictures though :( Bummer. But it was really fun. She is still in school and running for UVU so I don't get to see her very often. Then we went to our old stomping grounds and hung out with our old neighbors! I really miss them. We had such great neighbors and a great ward. I especially miss this little munchkin. Isn't he cute? Last night was our new ward Christmas party. It was fun, they have a lot of talented people in the ward! I got to play a violin duet with another lady, I loved it. Speaking of playing violin, I decided when we ever move north of point of the mountain I really want to be in the orchestra at Temple Square! I think that would be such a fun experience. I need to find out when tryouts are for violas. Tomorrow begins my last round of chemo! (Remember a round is three treatments). I really hope my white blood cell count is high enough! I've been trying to drink lots of carrot juice and not eat too much sugar. I really want to have my party on New Year's Eve. Keep praying for me and crossing your fingers! Christmas is my favorite holiday. This year will be extra special to me because I will be getting a late Christmas present of finishing chemo. 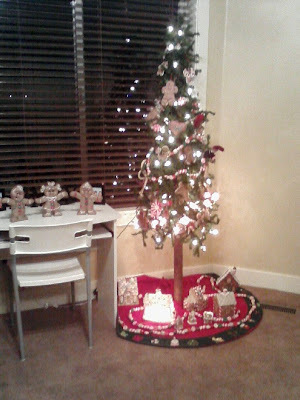 This week I got almost all my Christmas shopping done, went to a Christmas party and finally decorated. Then today I woke up to snow and it really feels like the season has finally begun! I also finally tried running again. Ever since Thanksgiving when I've tried to run my abdomen really hurts, especially along my incision. So I haven't run since Thanksgiving until Thursday when I tried it again. It didn't hurt at all and it was so nice to go again! Yesterday I went running with Sterling, it was freezing! But it was still fun to go. My teammates are the awesomest. Even though I am graduated they invited me to their Christmas party. It was a blast, I miss them. Plus we are all funny. Yesterday was my 14th treatment! (Technically my 13th because before my second surgery we skipped one time when my white blood cells were too low and we never made it up). But man, that means 4 left! Only one month's worth! How crazy is that? In only six short, sometimes long, months I will have gone from normal person, to cancer patient, to cancer survivor! I conveniently forget that I will still have a year's worth of treatments every three weeks when I'm done but....that's not important. I know your next question is "Have I ever thought about becoming a purse model?" And why yes, after this photo shoot I really think I have a future in it! On Sunday Sterling and I thought it would be fun to see if Koda could swim. So we filled up the bathtub and plopped him in. He loved it! Not. at. all. Haha, poor little guy looked so scared and sad. But he could swim and he did a good job. Mostly he just stood with his paws on the side of the tub wishing he could get out. He's not really very cute when he's all soaking wet! He looks like a rat. Or part chihuahua. Today I got to see one of my best friends Cesia on her birthday! She chose to spend her birthday morning with me at the temple. What a nice buddy. It was really fun, such a great way to spend my morning. And after that I went over to a lady in my ward's house and we played our violins/viola together! That was super fun, I have started playing more again recently and I am so glad. I always forget how much I like to play until I start doing it a lot. The blisters on my fingers have finally worn into calluses again too which is great. 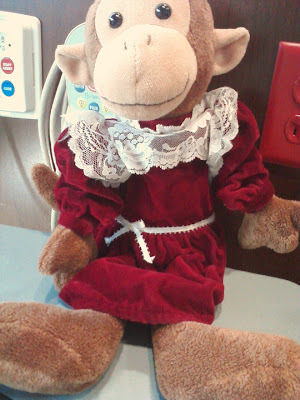 Monkey got her Christmas dress on. I think I'm going to make her a Christmas elf costume like her pilgrim costume. Until I get around to making it, she'll get to wear this dress. I don't have much to write about this week! Pretty un-eventful week for me. 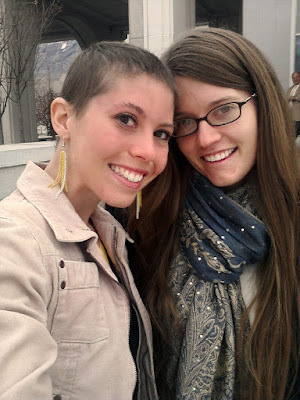 I did have an awesome day Wednesday, I got to go up to Salt Lake and hang out with my friend Cesia. We went hiking in the hills behind Red Butte Gardens and then had a picnic. I love picnics, they are one of my favorite things to do. The weather has been so beautiful! I love it. But I do wish the mountains would get a little more snow so I could go skiing. Unfortunately my eyes are closed, but this is our picnic! I always forget that I am much more tired on the weeks I get all three chemo drugs. I haven't been running at all, but I have gone on a hike or walk every day! Running has been a little too frustrating for me because it is so hard and my stomach along my incision hurts when I do it. So I decided instead of getting discouraged and frustrated I would just do other things that are fun :) I love to hike, so I've had a great time with that. Today Sterling and I went hiking in the hills behind his house. It was hard! Seriously like straight up hill the whole time almost! But it was really fun and we got pretty high. Next time I want to go all the way to the peak. We went until we ran into a dead end in the trail we were on. Koda is a little hiking champ! He loves going with us. I know pictures without people are boring, but it was so pretty. Monday brings another treatment! Only five more to go, can you believe it?! It seems like it has gone pretty fast for the most part. My hair started falling out this week :( Bummer. You can't tell yet, but it has begun. Ah well, it will come back again. 1 Peter 1:7 That the trial of your faith, being much more precious than of gold that perisheth, though it be tried with fire (or cancer, or fill in the blank), might be found unto praise and honour and glory at the appearing of Jesus Christ.